The Knight Commission on Trust, Media and Democracy held its second regular meeting at the Stanford Alumni Center on Tuesday, January 16th. On the evening of the 15th, the Commissioners gathered in Palo Alto for dinner and to hear a presentation on advancements in technology for creating and editing video content. The morning of the 16th was devoted to two panels of experts on media and technology, and the afternoon was devoted to two additional presentations, from Facebook and Gallup, and Commission deliberations. This is our rapporteur, Richard Adler’s, summary of the session. The public sessions of Tuesday, January 16, are available for viewing online: Session 1 and Session 2. Professor Agrawala has developed techniques to simplify and speed up editing of video interviews by providing a “transcript tool” that automatically generates text of an interviewee’s comments synched to video content. Tools now exist to edit video interviews by creating seamless transitions and adding pauses to disguise edits. A team at the University of Washington has created a tool that can take existing audio material and create synthetic but highly realistic new video of a subject speaking the words. [Synthesizing Obama: Learning Lip Sync from Audio]. Software developed at Princeton University makes it possible to edit audio material much like text: creating and inserting new words into an audio transcript [Technology edits voices like text]. Before long, it is likely that the ability will exist to create entirely synthetic video showing people saying things they never actually said. Just as software like Photoshop has made it possible to manipulate still images, new software will provide the ability to create “fake” video that is very difficult for viewers to detect. From a positive perspective, such software will provide new means for storytelling and could provide people who have lost the ability to speak (like Roger Ebert or Stephen Hawking) to do so in their own voices. But these advancements raise the question of how we can/will operate if we “can’t trust our senses” to tell us what is actually true. Of course, it has always been easy to tell untrue stories in print, and we are already dealing with “fake” photos (e.g., a shark supposedly swimming in flood waters from Hurricane Sandy). As Richard Gingras pointed out, “we have been manipulating words and images forever.” The reality is that every photo and every story is the result of many choices about what to include and what to leave out, and what point of view to adopt. Give users the ability to click on an image or video to see people/organizations that vouch for its authenticity. Provide a mechanism to capture the provenance of visual content from the point of capture through all subsequent steps to publication in a public write-only blockchain-type database (it was noted that such verification could create risks for “citizen journalists” or others who wish to remain anonymous to protect themselves). David Besbris, VP of Engineering, Google: People come to Google looking for information and Google’s goal is to provide them with “quality information” They want to provide information based on authority and quality across the political spectrum, to be “the [neutral] librarian of the Internet.” This has been a challenging time: the ecosystem has become polarized. They are seeing an increase in people trying to game the system. Dealing with this is not easy; it’s a moving target. Like the Washington Post, Google needs to defend its brand to maintain people’s trust. (Unlike Facebook), Google’s key metric isn’t time spent on their site, it’s the quality of results they provide to users. [Ethan Zuckerman suggested that the Washington Post, along with other traditional news sources, has suffered a “collapse in trust.” While Google is still relatively trusted, it could see a similar collapse in how it is trusted. For Google, its relationship to the news industry is important. They want to be sure that what they do is beneficial to the industry, that “information is sustainably produced.” Google depends on having trustworthy sources of information in order to provide quality information to their users. Gina Bianchini, Founder and CEO, Mighty Networks: Networks become more valuable as they get bigger, and Facebook is the biggest of all. Many good things happened on the “open web” in 2001-2010, but significantly, around 2011 “social networks turned into social media.” Today, the web is dominated by two platforms – Facebook and Google – which are essentially “black boxes” to both consumers and content producers who depend on them. These two companies have an effective monopoly on people’s attention. This may not always be true: many entrepreneurs are trying to figure out how to get around them. It may simply be impossible to have billions of people on one platform and still have meaningful conversations. How can we create a more distributed, decentralized world? It may be more likely to come about through the evolution of technology than through regulation. Business models: It’s great to get things for free, but when media are free to users, the users are the product being sold to advertisers. This formula started with radio and TV, but has been expanded with new media. “If it bleeds, it leads” and “if it’s outrageous, it’s contagious” are powerful mantras. Data: New tools for amassing and analyzing large amounts of data are allowing us to gain valuable insights in areas like health. With AI, these processes can be automated. But if systems can use data to deeply understand what engages people, they can provide new means for coercion. Automation: Robot reporters are coming. It’s becoming possible to create fake videos that “look too real.” We are changing the definition of what constitutes [trustworthy] evidence. Having a productive, authentic dialog online has proven to be much more difficult than he had imagined. He had not anticipated the power of bots to influence a discussion. These forces are hard to deal with. Key question now: how can we ensure that the incentives of tech companies are truly aligned with the best use of our attention rather than just working to monopolize it? Nathaniel Persily, Professor of Law, Stanford: The core underlying concept for the 1st Amendment is to support a marketplace of ideas. But it’s not necessarily the case that “true ideas” will win out as the number of voices multiplies. To understand the role of the First Amendment today, we need to look at the unique characteristics of technology and their impacts. Traditionally, we have thought about free speech as discourse between humans, not bots, and largely in terms of domestic, not global, dialog. And what is good about tech can also have negative aspects as well. What is new in communications today are three things: virality, velocity and volume. What is mediating information today is not Walter Cronkite but peer-to-peer sharing (virality) that can spread information far beyond its original source. And as information comes to us in a newsfeed, disconnected from its sources, it’s harder to tell legitimate from shady sources. Thanks to the Internet, information can be spread much faster than ever before (velocity). And there’s much more of it (volume). Firms: Many companies’ terms of service (TOS) would violate the First Amendment, but are ok for private firms. But what else is needed? Deletion – censorship sounds bad, but platforms are already doing it. Disclosure – one way to combat fake news is by providing more information about the source or what is true or not, but so far, this approach hasn’t been very effective. Dilution – combatting bad information with more good information. The Chinese government is attempting to dilute bad news by distracting the public to different topics. Deterrence – depriving bad actors (e.g., Macedonian producers of fake news) of income. There is a remarkable amount of experimentation going on now. What we will be talking about a year from now will be very different than today. Esther Wojcicki, Founder, Palo Alto High School Media Arts Center: She has been teaching journalism for 34 years, but now is facing a new problem: the need for media literacy and civics education. In fact, all 50 states mandate civics education, but it is taught theoretically not experientially. She now has 600 students at Palo Alto High School who work on 10 separate publications as well as in radio and television, web site creation, video production and photography. The secret of the program’s appeal and its effectiveness is putting the students in charge, allowing them to work independently, to be their own gatekeepers: “to teach digital literacy, the kids have got to be in control.” One barrier to expanding such a program is that most teachers don’t understand the differences between news, analysis and editorial content. Off the record sessions have been deleted. Just 33% of Americans have a favorable opinion of news media, while 43% have an unfavorable opinion. 58% believe that the proliferation of news sources has made it harder to be well-informed while just 38% say it is now easier to be well-informed. A majority of U.S. adults view cable news and the Internet as “positive for the news environment,” but a majority believe that the impact of social media has been negative. A minority of Americans (44%) can name a news source “that reports the news objectively,” and two-thirds (66%) think most news media do a poor job of separating fact from opinion. Political affiliation and age are strongly related to views toward media. Trust in media is highly influenced by partisanship, with Democrats largely trusting the media and Republicans distrusting. Older Americans tend to view the media more positively than younger adults. The next Commission meeting will be in Miami, FL, on Monday, February 19th, in conjunction with the Knight Media Forum. Subsequent meetings will be April 26-27 in Nashville; May 30-31 in Racine; and July 29-31 in Aspen. “French President Emmanuel Macron…is considering legislation that would require social networks such as Facebook to be more transparent about who pays for sponsored content, and is also thinking about giving the French media regulator more power to block or remove “fake news” content.” Matthew Ingram, “Europe tries to fight hate, harassment, and fake news without killing free speech,” Columbia Journalism Review, January 17, 2018, https://www.cjr.org/innovations/europe-youtube-facebook-free-speech.php. See, for example, Farhad Manjoo, “It’s Time for Apple to Build a Less Addictive iPhone,” New York Times, January 17, 2018, https://www.nytimes.com/2018/01/17/technology/apple-addiction-iphone.html. 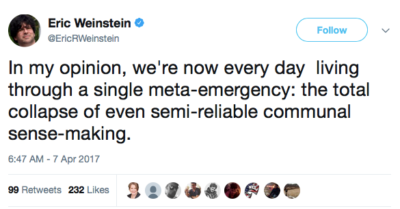 See, for example, Jay Rosen, “Show your work: The new terms for trust in journalism,” PressThink, December 31, 2017, http://pressthink.org/2017/12/show-work-new-terms-trust-journalism.